At the end the movie Butch Cassidy and the Sundance Kid, Paul Newman and Robert Redford reload their six-shooters and exchange a final round of wisecracks, then dash valiantly into a plaza rimmed with Bolivian soldiers. The movie, a box-office smash in 1969 and a late-night television chestnut today, closes with the wounded outlaws facing almost certain doom. The frame freezes before the antiheroes fall, however, leaving open the barest possibility of their survival. The movie is based on a true story, which began shortly after the Civil War. The outlaw known as Butch Cassidy, born Robert LeRoy Parker on April 13, 1866, was the eldest of 13 children in a Mormon family in Utah. His admiration for a young cowboy named Mike Cassidy and a stint as a butcher inspired his nom de crime. A stretch in a Wyoming prison for the theft of a $5 horse impelled him toward a life on the run. The Sundance Kid, born Harry Alonzo Longabaugh in the spring of 1867, was the youngest of five children in a Baptist family in Pennsylvania. After heading west at the age of 15, he ranched with relatives in Colorado, then knocked around the U.S. and Canadian Rockies, working as a drover and broncobuster. He earned his nickname by serving 18 months in jail at Sundance, Wyo., for stealing a horse. Sundance's companion in the movie was Etta Place. His companion in real life was an enigma. Although she has been described as a prostitute, a teacher, or both, no one knows her true origin or fate. Even her name is a mystery. The Pinkerton Detective Agency called her Etta on its wanted posters, but she called herself Ethel, which may or may not have been her real name. Traveling as Sundance's wife, she shared the alias Place (his mother's maiden name). Butch and Sundance belonged to a loose-knit gang that included the likes of Elzy Lay, Matt Warner, Harvey 'Kid Curry' Logan, Ben 'Tall Texan' Kilpatrick and Will Carver. 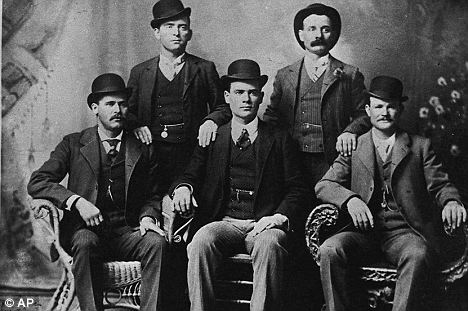 Dubbed the Train Robbers' Syndicate, the Hole-in-the-Wall Gang and the Wild Bunch, the band held up trains and banks and stole mine payrolls in the Rocky Mountain West, making off with a total of $200,000 (the equivalent of $2.5 million today) between 1889 and the early 1900s. With $1,000 rewards on their heads and the Pinkertons on their tails, Butch and Sundance fled to South America with Ethel in 1901. The movie takes them directly from New York City to Bolivia, but their initial destination was actually Argentina. After steaming into Buenos Aires on the British ship Herminius in March and taking the train to Patagonia in June, they settled in the Chubut Territory, a frontier zone in southern Argentina sparsely populated by immigrants, pioneers and Indians. Although most of the immigrants were Welsh or Chilean, several North Americans had journeyed to the same corner of the world, looking for open ranges. The bandits' nearest neighbor, for example, was John Commodore Perry, who had been the first sheriff of Crockett County, Texas. Butch and Sundance also traded and socialized with another Texan, Jarred Jones, who lived a two days' ride north, near Bariloche. Calling themselves James 'Santiago' Ryan and Mr. and Mrs. Harry 'Enrique' Place, the Wild Bunch exiles peacefully homesteaded a ranch in the Cholila Valley, raising sheep, cattle and horses. All three got on well with their neighbors, and if anyone came to know about Butch and Sundance's shady past, it never interfered with those good relations. So highly were they regarded that when Territorial Governor Julio Lezana visited the valley in early 1904, he spent the night in their home, a well-kept four-room log cabin on the east bank of the Blanco River. During the welcoming festivities, Sundance played sambas on his guitar and Lezana danced with Ethel. Meanwhile, in March 1903, the Pinkertons had sent agent Frank Dimaio to Buenos Aires, after receiving a tip that Butch and Sundance were living in Argentina. Dimaio traced their whereabouts, then cabled his superiors, saying the rainy season prevented him from going to Cholila. Before leaving Buenos Aires, he supplied the police with translated versions of the bandits' wanted posters. On February 14, 1905, two English-speaking bandits held up the Banco de Tarapacá y Argentino in Río Gallegos, 700 miles south of Cholila, near the Strait of Magellan. Escaping with a sum that would be worth at least $100,000 today, the pair vanished north across the bleak Patagonian steppes. Although Butch and Sundance were never positively identified as the culprits (whose descriptions didn't fit them as well as the modus operandi did), they were the prime suspects. Responding to a directive from the Buenos Aires police chief, Governor Lezana issued an order for Butch and Sundance's arrest. 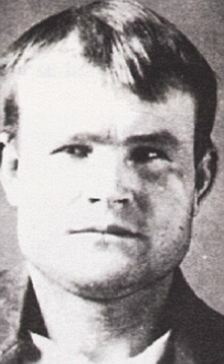 Before the order could be executed, however, Sheriff Edward Humphreys, a Welsh Argentine who was friendly with Butch and enamored of Ethel, tipped them off. In early May, the trio hustled north to Bariloche and took the steamer Cóndor across Lake Nahuel Huapi to Chile. Almost nothing is known about what the bandits did in Chile, but they apparently spent time in Antofagasta, the center of the nitrate trade on the northern coastal desert. The Pinkertons learned from a postal informant that Frank D. Aller, the U.S. vice consul in Antofagasta, had bailed Sundance (alias Frank Boyd) out of a scrape with the Chilean government in 1905. Late that year, the outlaws returned to Argentina on business. On December 19, Butch, Sundance, Ethel and an unidentified confederate heisted 12,000 pesos (worth about $137,500 today) from the Banco de la Nación in Villa Mercedes, a livestock center 400 miles west of Buenos Aires. With several posses chasing them, they slogged west over rain-drenched pampas and the Andes to safety in Chile. A few months later, Sundance briefly visited Cholila to sell some sheep and mares he and Butch had left with their friend Daniel Gibbon, a Welsh rancher. By then, Ethel was in San Francisco, having returned to the United States for good, and Butch was in Antofagasta, en route to Bolivia. In 1906, Butch (alias James 'Santiago' Maxwell) found work at the Concordia Tin Mine, 16,000 feet up in the Santa Vela Cruz range of the central Bolivian Andes. Sometime after selling the livestock in Cholila, Sundance (alias H.A. 'Enrique' Brown) hired on with contractor Roy Letson, who was driving mules from northern Argentina to a railroad-construction camp near La Paz. Sundance worked awhile breaking mules at the camp, then joined Butch at Concordia, where their duties included guarding payrolls. Assistant manager Percy Seibert, who had first met Butch and Sundance during a Christmas party at the Grand Hotel Guibert in La Paz, knew that his employees were outlaws, but he 'never had the slightest trouble getting along with' either of them. He found Sundance somewhat taciturn, but grew quite fond of Butch. After Seibert became the manager at Concordia, they were his regular guests for Sunday dinner. To avoid unpleasant surprises, Butch always took the seat with a view of the valley and the trail to Seibert's house. The bandits quit their jobs in 1908, after an inebriated Sundance bragged publicly about their criminal exploits. Although there is no proof of their having been anything other than model employees during their tenure at Concordia, Seibert credited them with several holdups in Bolivia. He said, for example, that they had robbed a railroad-construction payroll at Eucaliptus, south of La Paz, in 1908. The payroll was actually robbed twice that year. According to newspaper accounts, the perpetrators of the first holdup, which occurred in April, were 'three Yankees who had been employed as contract-workers.' The newspapers provided no details about the second robbery, which took place in August, after Butch and Sundance had left Concordia. Later that month, they turned up in Tupiza, a mining center in southern Bolivia. Intent on robbing a local bank, perhaps to finance their retirement in Santa Cruz, the outlaws needed a place to lie low while making their plans. They found a perfect hideout at the camp of British engineer A.G. Francis, who was supervising the transportation of a gold dredge on the San Juan del Oro River. Introducing themselves as George Low and Frank Smith, Butch and Sundance appeared at Francis' camp at Verdugo, 15 miles south of Tupiza, and asked to rest their mules for a spell. Their legendary charm soon won Francis over, and they wound up bunking with him for several weeks. While Sundance stayed with Francis, Butch made frequent forays into Tupiza, casing the bank and formulating his plans. Unfortunately, a detachment of visiting soldiers from the Abaroa Regiment, the Bolivian army's celebrated cavalry unit, was ensconced at a hotel on the same square as the bank–too close for Butch's comfort. Frustrated, and tired of waiting for the soldiers to leave town, the bandits turned their attention to the Aramayo, Francke y Compañía, which had mines in the area. Although the operational headquarters were at Quechisla, three days' journey to the northwest, the Aramayo family lived in Tupiza, and the money for the payrolls came through the Tupiza office. In conversations with an unidentified Aramayo employee, the outlaws learned that manager Carlos Peró would soon be taking an unguarded 80,000 peso payroll (worth half a million of today's dollars) to Quechisla. In late October, Francis moved his headquarters to Tomahuaico, three miles south of Verdugo, on the west bank of the San Juan del Oro. Shortly thereafter, Butch and Sundance decamped to Tupiza, where they staked out the office behind the Aramayo family's Italianate mansion, Chajrahuasi. Early on the morning of November 3, Carlos Peró picked up a packet of money wrapped in homespun cloth and set off from Chajrahuasi with his young son Mariano, a peon and several mules, trailed discreetly by Butch and Sundance. Peró and his companions spent the night at the Aramayo hacienda in Salo, then resumed their journey at dawn. The outlaws were now ahead of them, watching through binoculars as the group made its way up Huaca Huañusca (Dead Cow Hill), the peon and the boy on mules and Peró on foot in the rear. At 9:30 a.m., Peró's party rounded a curve on the far side of the cactus-studded hill and found the trail blocked by Butch and Sundance, wielding brand-new small-caliber Mauser carbines with thick barrels. Dressed in dark-red corduroy suits, with bandannas masking their faces and their hat brims turned down so that only their eyes were visible, the bandits had Colt revolvers in their holsters and Browning pocket pistols tucked into their cartridge belts, which bulged with rifle ammunition. Sundance kept his distance and said nothing. Butch politely ordered Mariano Peró and the peon to dismount and asked Carlos Peró to hand over the payroll. Unable to offer any resistance, Peró replied that they could take whatever they wanted. Butch began to search their saddlebags but could not find the money, so he told Peró to open their luggage. Speaking in English, Butch explained that he was not interested in the money or personal articles of Peró or his companions but only in the 80,000 pesos they were carrying for the Aramayo company. When Peró replied that they had only 15,000 pesos (worth $90,000 today), the larger payroll having been scheduled for the following week, Butch was stunned into silence. Perhaps as compensation, he took not only the packet of money but also a fine dark-brown mule that belonged to the company. Sundance Kid - bottom left; Butch Cassidy - bottom right.